Hello! I'm here with a card using the latest Mojo sketch, #300! Julee is having a big celebration and there are lots of generous prizes to be won along with some special discounts. Be sure to check out the details on the Mojo Monday blog! I used Fruity Friends (Taylored Expressions) today. 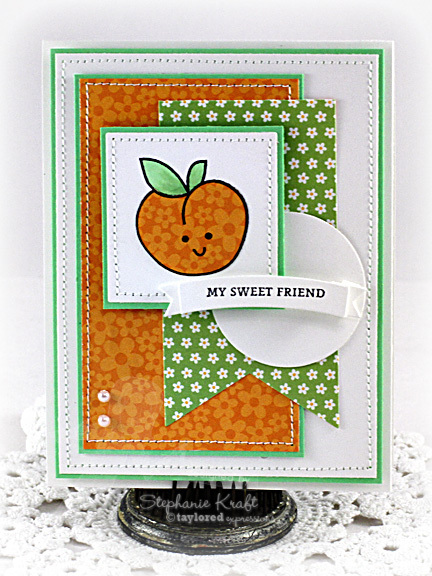 I stamped, colored and paper pieced the peach. The sentiment is from A Little Love. TE is one of the sponsors offering up a prize! You still have until 11:59 PM MST tomorrow to enter. Be sure to check out all the details on the Mojo Monday blog! Please note that I have not provided direct links to the TE store. At this time, the store is closed and will re-open on Monday. I'll be back then to help launch the brand new TE web store! Accessories: Taylored Dies: Branches, Banner & Bloom, Banner Stacklets 1 (TE); Standard Circle Nestabilities, Classic Square Nestabilities (Spellbinders); Markers (Copic), Pearls (Queen & Co), Foam tape, Thread, Sewing machine. Oooh, so sweet, Stephanie! I love this set and the paper piecing is spot on! Great job with the challenge, love it! This is absolutely adorable, Steph! xoxo! super cute card Stephanie! Love the sweet little fruitie friend! This is gorgeous Stephanie! I love your use of white space on this one and the fabulous bright colors! LOVE this!!! LOVE your paper piecing and the colors are fabulous! !